What is it about supermarket fruit? It looks so luscious when you see it sitting proudly displayed. The mouth waters imagining the tasty delights and a bit of juice dribbling down to the chin. So, even though its not on the shopping list, you pop half a dozen into the trolley. They sit beautifully on the bench for a day and then Mr MWCED says, “those peaches are starting to turn”. Whaaaat? One Day! Suddenly the menu for the evening (luckily its the weekend so there is time for a menu – and the weekend also means my turn to take over the kitchen – though the kitchen never really gets completely taken over). Quick google and the simplest looks the best. Sophie Dahl’s roasted peaches, though really one could hardly lay claim to fame for such a straight forward piece of cooking. 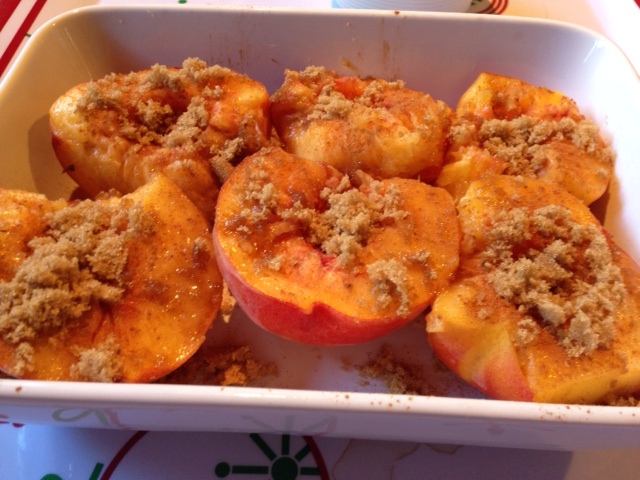 Slice off a few manky bits, put some brown sugar, cinnamon and dots of butter onto each peach and, voila!, about 20 mins in the oven and you are once again drooling at that lovely fruit. Don’t think we have had Ms Dahl’s cooking programs yet on telly here, seems you either love her or hate her, quite looking forward to seeing what all the fuss is about.